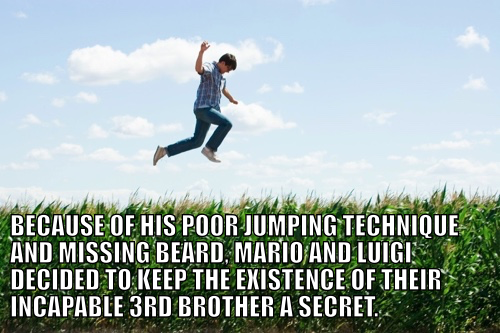 Because of his poor jumping technique and missing beard, Mario and Luigi decided to keep the existence of their incapable 3rd brother a secret. Man, tight rope walking is harder than it looks. Able to leap tall cornfields in a single bound. I never thought I could feel so free-ee-eee! Friends, Kryptonians, Countrymen. Lend me your ears. Smallvilles annual corn jumping contest winner Clark Kent.